Ok - last Hawaii post, I promise! Here are some odds and ends of food we had on our trip that didn't make it into a post of their own. Above is the cold soba lunch at I-naba Soba in Honolulu. We had never had soba served this way before, and we really enjoyed it. Rather than being served as a soup, you dip the noodles into the sauce. 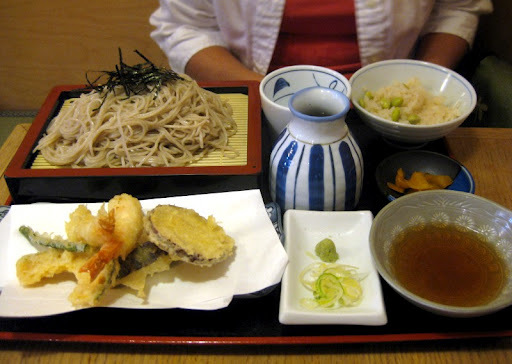 The soba was fantastic, as was the tempura. Although we had Oahu's north shore locked in as a shrimp destination, our first shrimp of the trip was at Savage Shrimp in Koloa on Kauai. 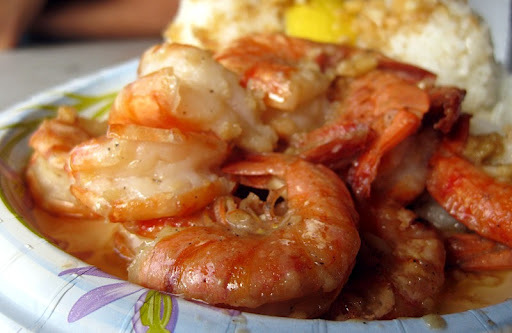 We had the place's namesake "Savage Shrimp" dish. 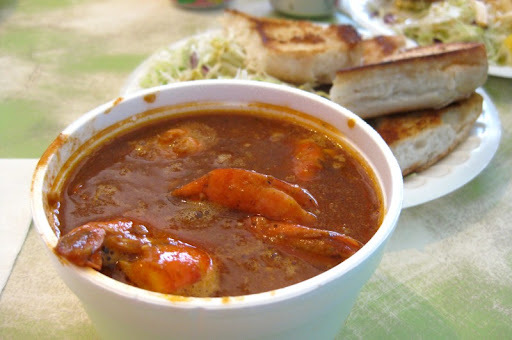 Served in a spicy broth with bread on the side for dipping, it was hearty and flavorful. Later, on Oahu, we made it out the north shore. We had a hard time deciding which of the shrimp spots to hit up. 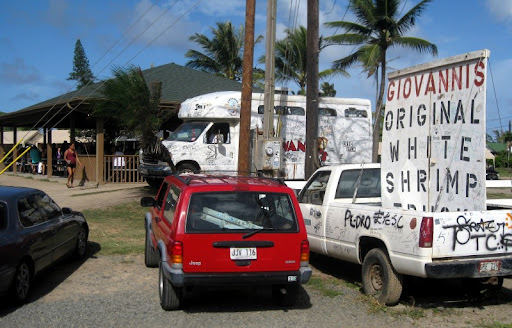 In the end, we settled on Giovanni's Shrimp Truck - mostly because we were on the bus and it was near a stop. Simple fare, but good. There was a ton of garlic in the sauce - which we really liked, but if you aren't a garlic fan, this wouldn't be for you. 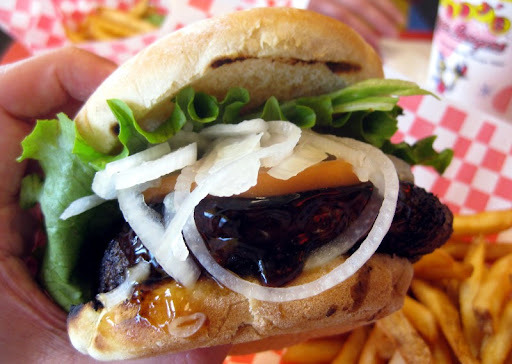 One night, we were wandering out from our vacation rental at the south end of Waikiki and Sherry spotted Me's BBQ. 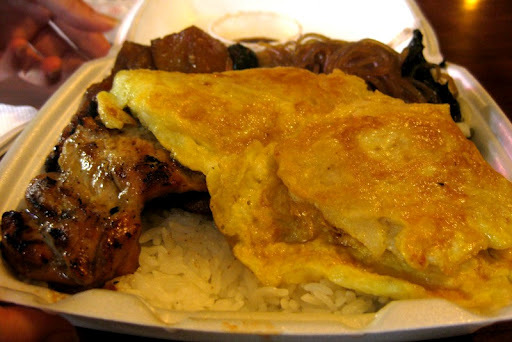 A tiny little Korean joint tucked away on a side-street, the feel of the place immediately appealed to me. They have a small indoor area with a counter where you order, and a few tables outside. We like the Jun so much that we made our own version as one of the dishes in our Feast of the Seven Fishes last Christmas Eve. 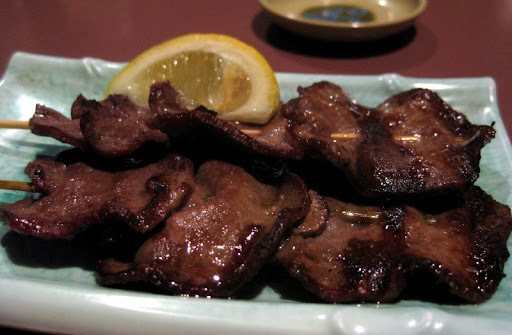 We also really liked their Kalbi and Kimchi. Unfortunately, it was dry and uninteresting. One of my least favorite burgers I've had in quite some time. And pretty expensive, to boot. Not recommended. It was very tasty for breakfast - sliced up and fried with eggs. 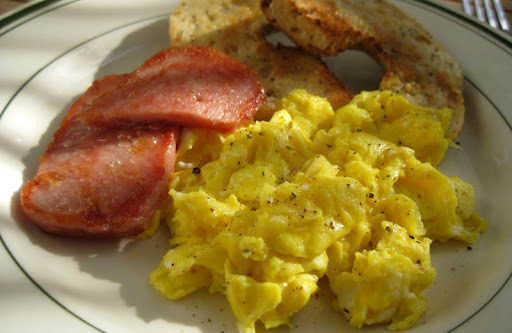 Spam and eggs made a lovely breakfast one morning on the tiny balcony of our vacation rental in Honolulu. 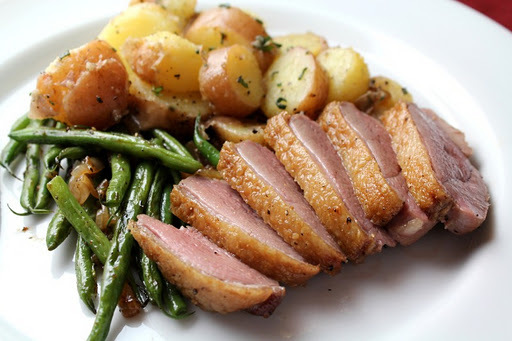 When we make a good dish, but I don't really have enough for a blog post, I often post a picture on twitter instead. For those of you who don't follow along with those tweets, I figured I'd do a round-up of some of the pictures here on the blog. 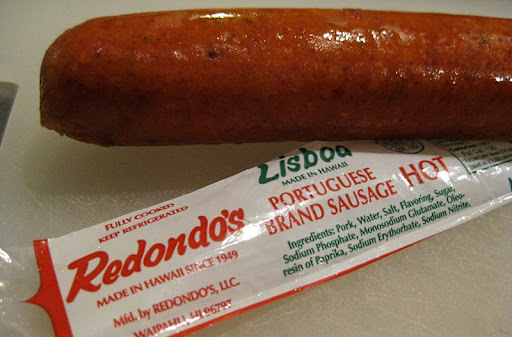 The picture above is a homemade Sicilian sausage (one of our favorites - we need to do a post on making them sometime) with Hasselbeck (or is it Hasselback?) 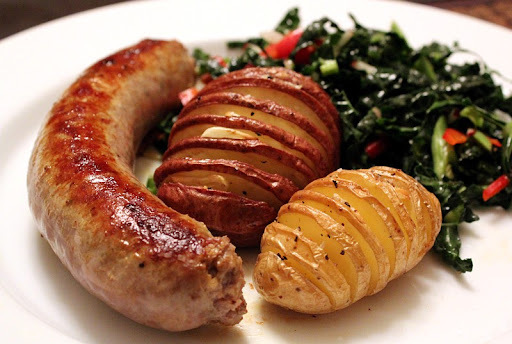 potatoes and a black kale salad. 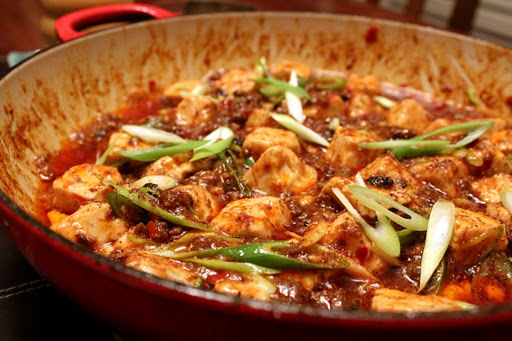 Fuchsia Dunlop's version of "Pock-Marked Mother Chen's Bean Curd", from her book "Land of Plenty" is on our regular rotation. 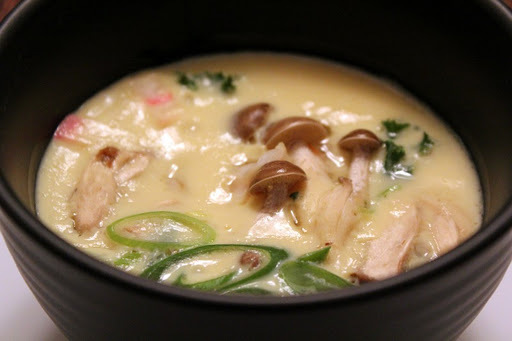 This was our first attempt at making Chawanmushi, and it turned out really well. I love savory custards. Not quite homemade ramen - I call it "home-assembled". 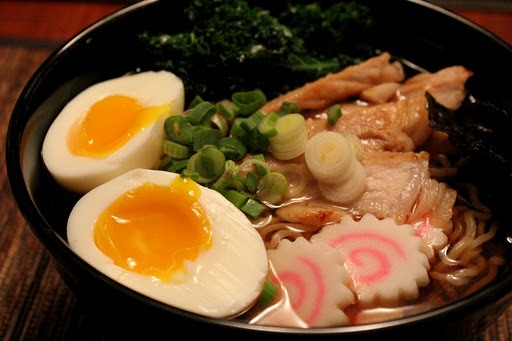 We buy packaged ramen noodles and add the trimmings - fish cake, pork slices, greens, nori and, of course, a soft-cooked egg. 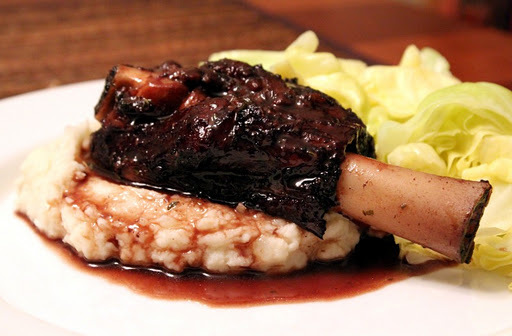 Is there is anything more comforting than a braised lamb shank? We do a red wine braise based loosely on a short rib recipe from Daniel Boulud's "Cafe Boulud Cookbook". 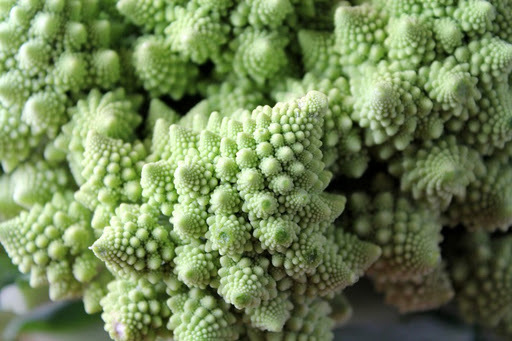 The first time I saw a picture of Romanesco I was amazed - it is such a cool looking vegetable. Sherry has had great success growing them this winter, and we've been eating a lot of it. 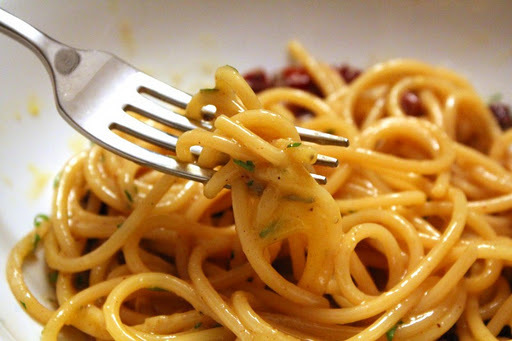 Perfectly cooked spaghetti coated with egg is a thing a beauty. 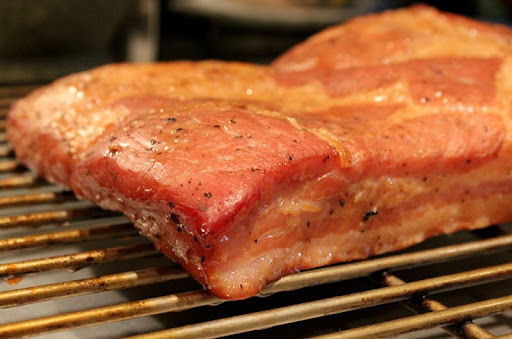 We make ours with homemade pancetta, which I prefer to the traditional guanciale. 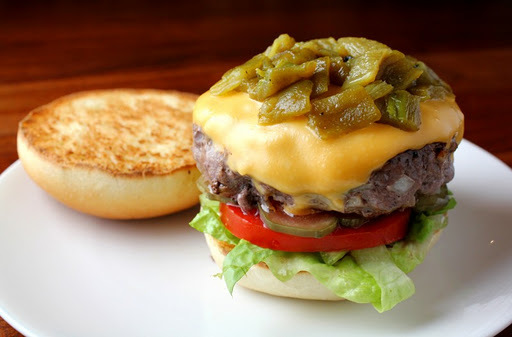 We've posted a number of times about green chile cheeseburgers in New Mexico, but we also make them at home, using hatch green chiles that we buy by the crate when they are in season. Yes, that is American cheese on the burger. I make no apologies. Light, puffy and cheesy - Gougères may be the perfect snack. 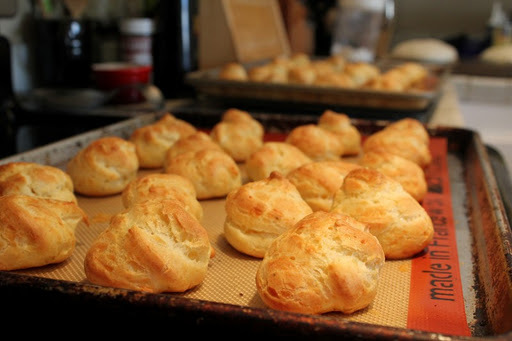 They are made with the same choux pastry technique used for cream puffs, but go a savory direction instead of sweet. Rosy pink meat and succulent skin - what more is there to say? It has been over three years now since we started making our own homemade bacon, and we're still going strong. Store-bought bacon is a thing of the past for us. We're almost out of the last batch we made - time to make some more!